Hamas, the group that governs the Gaza Strip, says it has reached an Egyptian-brokered ceasefire with Israel after an exchange of fire on Monday. Israel has yet to comment. The reported truce comes shortly after multiple rockets were fired from the Gaza Strip towards Israel on Monday evening, according to a joint statement issued by Gaza’s armed groups, in response to Israeli air strikes that pounded Hamas positions across the enclave. Hamas and the Islamic Jihad in Gaza said in a joint statement said they fired targets across the border and warned they would escalate if the Israeli army launched further attacks. Sirens were sounding in multiple places in southern Israel close to the border, the Israeli army said. 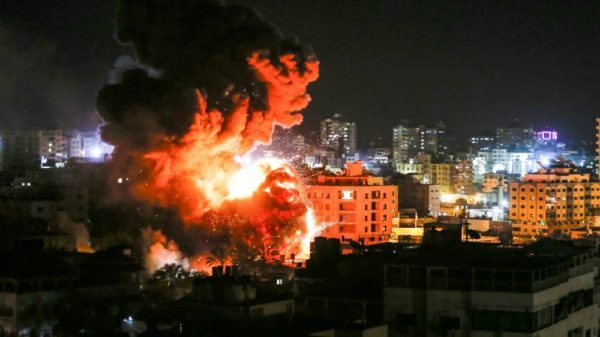 Earlier on Monday evening, Israeli warplanes launched air raids against Hamas positions across the Gaza Strip, in retaliation for a rocket from the Palestinian enclave that hit an Israeli home. As the Israeli assault began, residents in the northern part of the Gaza Strip reported hearing the sounds of explosions earlier on Monday evening. Local media reported that air strikes landed in an agricultural area east of Khan Younis in Gaza’s south. Al Jazeera’s Harry Fawcett, reporting from the Gaza-Israel border, said several empty buildings associated with Hamas have been hit. “We’ve seen several plumes of smoke coming up from the Gaza skyline behind us and we’ve seen confirmation from the Israeli military that these strikes have begun. “From our colleagues inside Gaza, we’re hearing that so far, the targets seem to have been empty training camps associated with Hamas’ military wing … also a sea base as well,” Fawcett said. Later he said a building “right in the middle of densely populated Gaza city” had been “entirely destroyed”. Ambulances were on the scene, but there had four small warning explosions prior to the largest one that flattened the building that may have allowed people to get out of the area. Israel said it had destroyed Hamas’s military intelligence headquarters. Gaza’s health ministry says seven Palestinians have been wounded in the attacks. Israel has blamed Hamas for the rocket launched into Israel early Monday that injured seven Israelis when it landed in central Israel. “The Israelis continue to impose a crippling siege on the Gaza Strip and practise all kinds of aggression against Palestinians … Therefore, the Israeli occupation should bear the consequences of its actions against our people in Gaza and the West Bank and in Jerusalem, as well. Hamas will not leave our people undeterred … the resistance will strike back if needed”. He condemned the Israeli response. “The Palestinian cause is being attacked on various fronts – in Jerusalem, the West Bank and Gaza, as well as inside Israeli jails. “We must face this onslaught with a united national front, and in coordination with our Arab allies … Our people and the resistance will not surrender if the occupation crosses red lines”. Ashraf al-Qudrah, spokesperson for Gaza’s health ministry, said hospitals and medical points across the strip are ready and on high alert. The health ministry has also called on residents to take precautions as Israel begins to launch attacks across Gaza. Israel issued a similar warning about an hour before the raids began, telling Israeli residents to open bomb shelters in the expectation of potential rocket fire coming from inside Gaza in response. United Nations Secretary-General Antonio Guterres is “gravely concerned” by the recent developments in Israel and the Gaza Strip and urges all sides to exercise maximum restraint, UN spokesman Stephane Dujarric said. The escalation comes 10 days after rockets were fired from Gaza towards Tel Aviv – in which Hamas denied responsibility. Israel has long said it holds Hamas responsible for all violence from Gaza, controlled by the group since 2007. It was the first time the city had been targeted since a 2014 war between Israel and Hamas. At the time, Israel said it had targeted 100 Hamas positions in the besieged Gaza Strip, home to more than two million Palestinians. Israel has also waged three offensives on Gaza since December 2008, a year after Hamas assumed control of the coastal enclave. The last war of 2014 severely damaged Gaza’s already weak infrastructure, prompting the UN to warn that the strip would be “uninhabitable” by 2020. Tensions have been high for the past year along the Israel-Gaza frontier since Palestinians began popular protests near Israel’s fence west of the Gaza Strip, protesting their right of return and demanding an end to the 12-year-siege. The siege has devastated the local economy, severely restricting food imports and access to basic services. It has also stopped the flow of construction materials. Since the start of the protests, dubbed the Great March of Return, nearly a year ago, the Israeli military has killed more than 200 Palestinians. About 60 more have died in other incidents, including exchanges of fire across the fence. Two Israeli soldiers have been killed by Palestinian fire. Meanwhile, Egypt, Qatar and the UN are trying to broker a long-term truce between Israel and Hamas, but that effort has yet to bring about an agreement. Israeli President Benjamin Netanyahu appeared alongside US President Donald Trumpin a press conference at the White House shortly after the raids began. Netanyahu said Israel was “responding forcefully” to what he called “wanton aggression”. “We will do whatever we must do to defend our people and defend our state,” he said adding that he will cut his meeting short to return to Israel. Trump called the attack on Tel Aviv “despicable” and said that the United States “recognises Israel’s absolute right to defend itself”, describing the alliance between the US and Israel as “unbreakable”. During the press conference, Trump signed a proclamation formally recognising Israel’s sovereignty over the occupied Golan Heights, a move that reversed decades of US policy. The recognition is expected to come as a boost to Netanyahu, who is running for re-election in Israel’s presidential elections next month.